1st Wednesday at 7:00 P.M. The Middletown Lions Club No-Kid-Hungry weekend Back Pack Program has been recognized as necessary for those families of local school children that have little or no food available over the weekend. Completing its third successful year, the program is currently serving about fifty families of children from four Middletown elementary schools each weekend. Each back pack includes a healthy variety of foods such as fresh fruits, boxed milk and juices, peanut butter and jelly, crackers, canned fruits and vegetables and granola bars. The total number of back packs filled in the 2013-2014 school year by our program was 1,474 which is approximately 10,318 weekend meals for children who are suffer from food insecurity every day of their lives. The average cost of the food in each backpack is $10.00. Our club has received $4940.00 in donations from the community confirming the need and importance of this club project. As more funding becomes available we hope to be able to serve more families. There is a waitng list of families for this program. As confirmed in recent news articles in the Times Hearld-Record, 73% of our children receive free or reduced breakfasts and lunches when school is in session. The Middletown Lions Club is working to fill the needs of these children over the weekends and holidays. We gratefully accept monetary and foond donations. 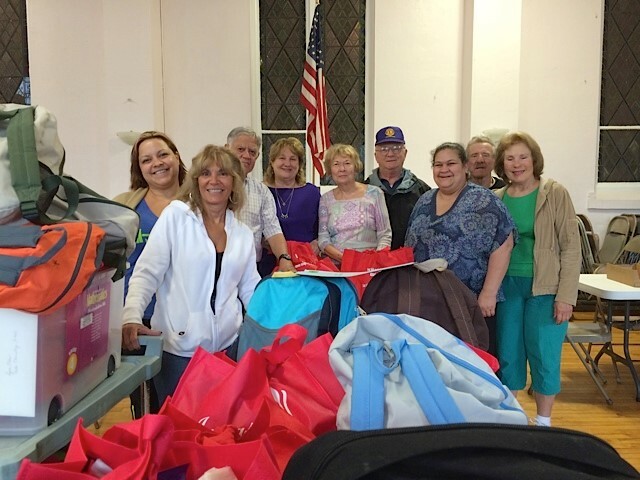 The Middletown Lions Club could not accomplish this program without their partnership with St. Paul's United Methodist Church in Middletown, the City of Middletown Interfaith Food Bank, the endorsement of Dr. Eastwood and the Greater Middletown Area School District Board of Education and the Principals and Social Workers of the four elementary schools we serve. Thank You! The Middletown Lions Club with the endorsement of the Greater Middletown Area School District began the first Weekend Back Pack Snack program in an elementary school designated by the Superintendent in 2011. With the support of St. Paul’s United Methodist Church Mission and the Interfaith Food Pantry, the first fifteen students were selected by the school’s social worker, nurse and principal to receive a back pack every Friday filled with nutritious food for weekend consumption. Some of the items included are fruit juices, granola bars, cereal, milk, Mac n’ cheese, soup, and fresh fruits when available. When a need is determined by the school’s staff, the back packs also contain donated personal hygiene items from the Lions as well as socks and underwear. The back packs are returned on Monday to be filled again by the Lions for the next weekend. The Middletown Lions then extended the program to ten students in another elementary school and eventually to all four schools. Today, 59 children and their families receive a weekend back pack. We hope to provide more children with weekend back packs filled with nutritious meals in the future as our fund raising efforts continue and the community support through donations of food and funds continue to increase. The project all began when PDG Ed and Past President of the club Diane Budd saw a program on NBC hosted by chef Giada De Laurentiis. The celebrity chef was reporting about a Rock Hill, South Carolina school with a program called “Pack the Back” which sends needy students home on Fridays with backpacks full of nonperishable nutritious food. Teachers pass them out discreetly, visiting classes while kids are at lunch or recess. Educators suspected students were malnourished for some time as children would take food from classmates during lunch, ask cafeteria workers for seconds or thirds and wrap part of their meal to take home. In a survey of teachers, nurses and guidance counselors about problems that keep students from learning it was discovered that one in 17 students leave school on Fridays and don’t eat another full meal until they return to school on Monday morning for their free or reduced cost breakfast. During a Zone Meeting the Budds learned from a fellow Lion in a neighboring club (Town of Deerpark) who is a teacher in the Middletown school system that many teachers and nurses routinely purchase food for students who are hungry and ask for food. The Budds were inspired and received the approval of their club to investigate the possibility of providing the same service to students in their school district. Diane started by going to the school’s website and contacting the Community Liaison, Kevin Witt. He in turn took the request (actually hand delivered it) to the Superintendent of the school district who endorsed the idea. Dr. Eastwood sent it on to the school’s nutritionist, Kathy Perry, with a note that he would like to see this program in the school system. Ms. Perry called Diane and told her that 73% of the students in the district receive free or reduced cost breakfast and lunch and that the “Back Pack” program would be welcomed by the district. She directed Diane to contact the “Feeding America” organization who put her in contact with Andrea McNeil of the Food Bank of the Hudson Valley. Ms. McNeil explained that the “Back Pack Snack” program was nation-wide although there was only one program in the Hudson Valley in the Warwick School District supported by community volunteers and started by a church. The MLC needed a 501(c)3 organization to purchase food from the Northeast Food Bank. Andrea McNeil suggested we contact Millie Velez-Rivera of St. Paul’s United Methodist Church Mission and the Middletown Interfaith Food Pantry for help. Ed and Diane asked Millie if the church would help us with this community outreach program and she said it was an answer to her prayers. Millie sees every day the need to feed hungry children. She sought approval from the church and our “No Kid Hungry” weekend back pack program settled in to St. Paul’s United Methodist Church’s fellowship hall. Millie places our order (from Chair Glenice Foglia) with the Northeast Food Bank along with that of the Interfaith Food Pantry. She arranges to have it picked up in Cornwall, unloaded and put away with help from personnel from the church and the Interfaith Food Pantry. Occasionally she will call Lions if she needs the help. Fortunately, members of our club came forward to manage this huge project. Chair Secretary Glenice Foglia and PP Marlinda Duncanson are our foundation. They are dedicated to feeding hungry children. It is just not a matter of buying the food and filling back packs. The back packs have to be delivered to each of four elementary schools each week school is in session (about 15 to each) and then retrieved the following week to be refilled again. The food has to be moved from our storage area on the second floor to the main floor on Thursdays for packing. Glenice keeps track of how many back packs are filled each week and the number of food items in each back pack. She keeps a detailed journal for each week so that our club knows how much it costs to fill a back pack each week. 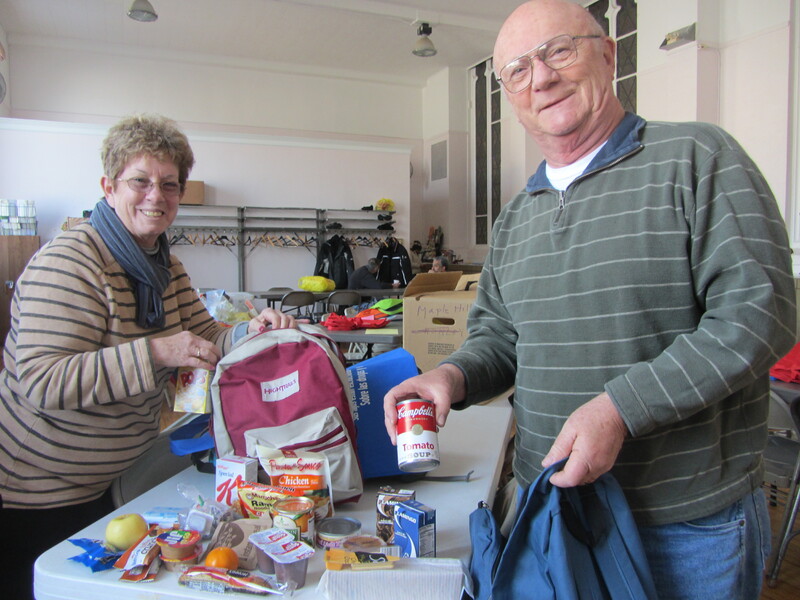 Depending on donations the cost per back pack ranges from $2.86 to $10.80 each week. Someone has to collect and/or receive donations and organize them. Glenice has also partnered with ShopRite and is able to buy many of the items needed at less than food bank prices. Again, someone has to do the shopping, the loading, the unloading. Thank God for selfless volunteers with a passion! Past Presidents Marlinda Duncanson and Al Propeack help fill back packs with nutritious kid-friendly foods for the weekend at Fellowship Hall in St. Paul's Methodist Church in Middletown. Lions and friends fill 48 back packs every Thursday school is in session from October through June. During long weekends and holidays more food is added and special donated goodies are always a treat for the children. Our volunteers then deliver the back packs to the four elementary schools in our district and the school's social workers distribute the back packs and bags to the students on Friday for weekend consumption. The students return the back packs and bags to the social worker by Tuesday of the following week and volunteers pick up the back packs at each school on Wednesday or Thursday to be refilled for that week.